I am super excited about these cabinet pulls! The price is excellent. They are substantial and look much more expensive. The vertical pulls in the photo are 8”. The horizontal pulls on the top left drawers are 8”. The center drawers are 12”. The top drawers on the right are 5”. I highly recommend them! Pardon my construction pics! 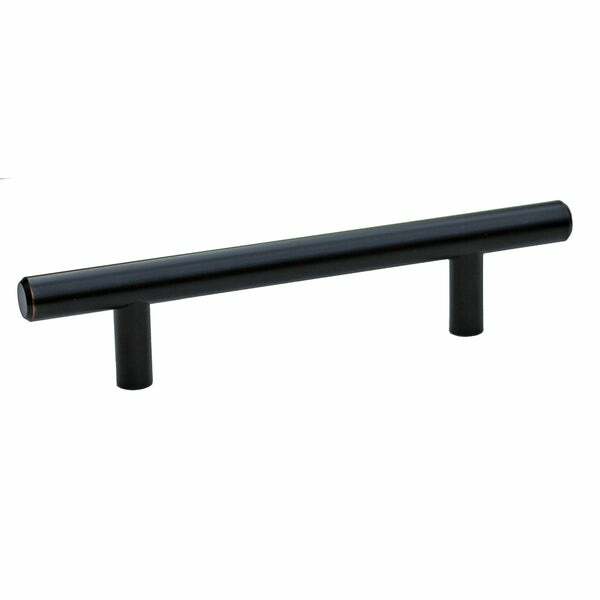 Update your kitchen or bathroom cabinets with these modern cabinet bar pulls from GlideRite. The sophisticated round bar design makes them easy to grip and use, and they come carefully bagged individually to prevent damage during shipping. Best when purchased in bulk. Love these! 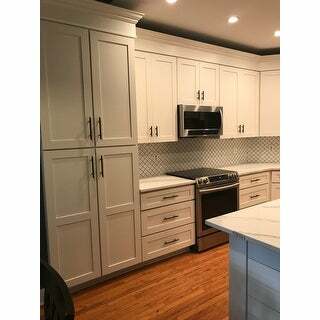 I purchased these cabinet and drawer pulls when I wanted to upgrade the look of my builder's grade oak cabinets. I painted the cabinets, and decided that the oil rubbed bronze would be too dark. So i painted them! Try finding these at an affordable price in copper or gold...it's just not done. They were easy to install while using a hole guide to make sure I drilled the holes properly. Each comes individual wrapped in sealed plastic, which helps you keep them from getting damaged. 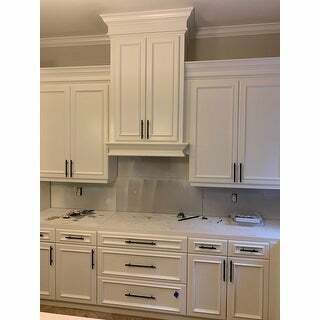 We bought these pulls, along with some matching 5 inch pulls for our new ivory shaker cabinets! They are gorgeous! We have oil rubbed bronze light fixtures, and they tie the whole kitchen together. Very solid and sturdy. Recommend! These are extremely high quality, with a great weight to them. They were so inexpensive I was skeptical - but they are wonderful. Buy! I love the oil rubbed bronze color and it has excellent quality. Looks amazing on my white cabinets. I have installed them in my kitchen and all bathroom cabinets. Feels great when you hold them as well. They come in variety of sizes, so you can pick and choose as you need. You will for sure love these. Was looking all around for black bar pulls. And kept coming back to these, honestly because the price seemed too good to be true. I was nervous that the "oil bronzed look" might be a little too shabby chic for me but it's hardly noticeable and very minimal compared to other oil bronzed finishes I have seen. And the quality was MUCH better than expected, seem very well made - would recommend. These handles arrived quickly, were packaged well, no damage. They are very heavy and look great installed. I love them, they are just the look we were going for. You will need to purchase a template to install them. Not all templates will work. The templates are inexpensive and will make installation a breeze. I highly recommend these handles. I love this hardware for my kitchen cabinet! They are Well made and a nice color. I wish it came with longer screws but I just bought new ones. You will be happy with them. Product came packaged nicely in a set of 10. Haven't had a chance to put them on the cabinets but they look like the image and feel sturdy and well made. Came with the necessary hardware and was shipped very quickly. Beautiful and great quality. Super happy with these pulls! Looks great and helped update my kitchen. "What is the spacing size between the holes. I need to make sure it will fit the holes I already have "
"We need 21 of these pulls, any way to purchase two sets and then purchase one individually?" We don't sell them individually. "Do these have a bit of copper color edging on the ends?" We try our best to represent products accurately, however, due to differences in displays and the subjective nature of colors, shades may vary slightly.